opened in October 2012, and has quickly become a local favorite spot for breakfast and lunch. 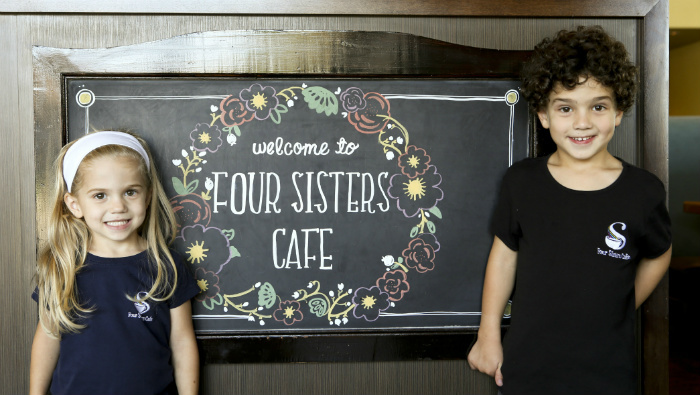 Four Sisters Cafe is conveniently located near the Galleria Mall and offers a great escape from the everyday hustle and bustle of life. Our friendly staff, clean, comfortable ambiance and unique menu keep patrons coming back again and again. We are four sisters working together to cater to the hearts of the community. We are known for our fresh, high-quality ingredients, homemade meals, and exceptional customer service. Our “home” inspired menu features dishes such as mango stuffed french toast, eggs benedicts, thick sliced bacon that is cured and smoked in-house, along with homemade soups, specialty salads, and sandwiches such as our prime rib french dip. All of our soups, sauces, batters and even our syrup is made from scratch. Whether you come in for breakfast or lunch, a special occasion or a quick break from work, Four Sisters Cafe promises to deliver a dining experience that will keep you coming back for more.